Okay so between you and me, I don’t always read the whole book club book. The club I’m a part of is run by Amy Cairn of Academy Mortgage. All the books are great additions for personal and professional development, and thanks to the dynamic of group guilt, I am reading more of these books than I normally would. However, if I’m honest, some months I’m not sorry to see parables and big margins. 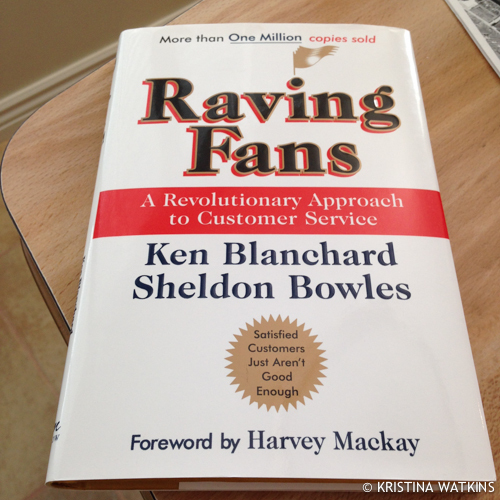 August’s book fits that bill: Raving Fans, by Ken Blanchard and Sheldon Bowles. There isn’t an industry that couldn’t be improved by building rapport with customers. I sell real estate, and my clients should be so madly in love with my service that they tell their friends. Amy is a mortgage broker who provides this book club service, and here I am telling you about her. Word of mouth advertising is serious business, especially when I can just click “Tweet” and tell 900 people about my experience instantly. I’m excited to get through this one, and will report back on what I see in it that applies to my business.